This is ‘THE’ gig of the year and a special charity event in tribute to the late great local blues musician and ex-park school science teacher John Sharp, who sadly passed away on April 1st this year after a short battle with cancer. As many people will know John was very well known on the local music scene in the South West and a key founder member of blues rock band Spoonful, who were a hugely popular local band playing gigs and festivals. He appeared many times over the last few years at open mic nights at The Thatch Inn, Croyde & The Kings Arms in Georgeham, guesting with the house band and truly lived for the love of blues music. 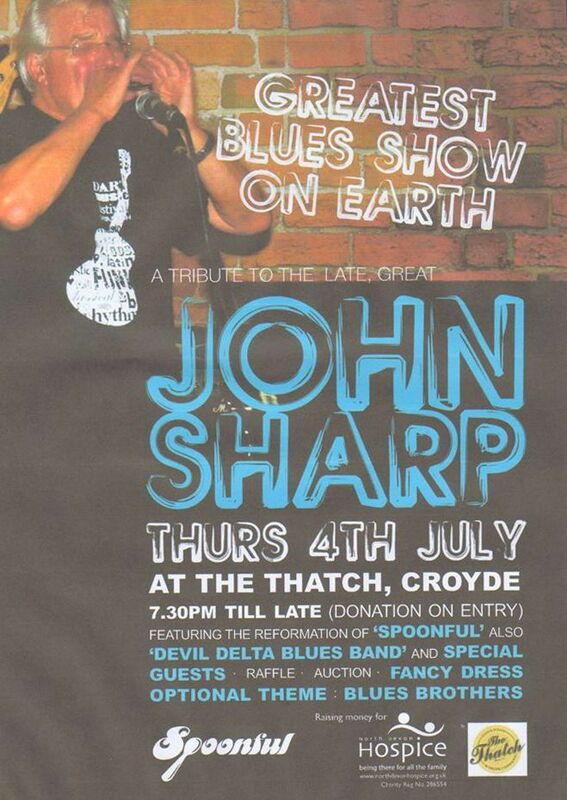 He will be sadly missed by all, and in tribute his son and local Johnny we are holding a lively night of the best stomping electric live blues music at The Thatch, Croyde, featuring the most talented musicians North Devon has to offer. The evening will feature the reformation of blues rock outfit ‘SPOONFUL’, with the classic line up of guitarist Johnny Sharp, Robin Courtnadge – lead vocals, Neil Pritchard – bass guitar, Rob Delve – drums & Tom Nordon – vocals/guitar + top local rhythm & blues outfit THE DEVIL DELTA BLUES BAND featuring Robin Courtnadge – vocals/guitar, Glen Dawson Davey – drums, Joel Squires – blues harp, Richard Newbery – lead guitar, Giles – bass guitar + special guest appearances by a few other familiar faces and a big old join in together at the end to finish off the best night of the year. We hope to raise as much money as we possibly can for The North Devon Hospice and will be holding a raffle with prizes + optional fancy dress with a ‘blues brothers’ theme. Let’s all raise a glass in tribute to a great musician and friend and dance the night away!!. See everyone there for a rocking night & party!! Great Gig last night well done Johnny, Rob and all.